Alex Haley’s Roots is one of the world’s most beloved and important books. In A Different Kind of Christmas, the intense drama of a white Southerner and a black slave who work toward a mutual goal, Alex Haley once again gives us a moving story of physical and moral courage, and an unforgettable tale of spiritual regeneration. Rendered with a matchless sense of time and place, a poetic humanness, and a rich, robust humor, A Different Kind of Christmas will delight and inspire readers of all ages and faiths for generations to come. The awakening of a white Southerner to the evil of slavery is the subject of this novella, for readers of all ages. It is a very special novel that sparkles with the same memorable writing that made Roots an American classic. A Different Kind of Christmas is the story of Fletcher Randall, a nineteen-year-old white Southerner from North Carolina whose politically powerful father is a plantation owner, and, of course, a slave owner. The time is 1855 and all Fletcher knows and believes about slavery he has learned from his father. But Fletcher goes to school up North, and one or two of his Princeton classmates talk about how wrong slavery is until Fletcher begins to think for himself—and he becomes a traitor to his background, to his family, by conspiring to aid in a mass escape of slaves on the Underground Railroad. His partner in this plan is a black slave by the name Harpin’ John, a man who plays the harmonica so sweetly it could make a grown man cry. Christmas Eve is the secret date set for the escape. How these two men of such incredibly opposing backgrounds join together to achieve the goal of freedom makes A Different Kind of Christmas soar with unforgettable inspiration. It is a timeless tale of spiritual regeneration, moral courage, and powerful humanness, meaningful and memorable to readers of all faiths and ages. 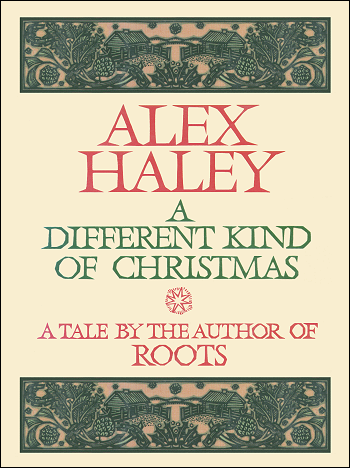 You can also read the Alex Haley Interview about A Different Kind of Christmas.